Collaboration with a fellow artist is an amazing way to share and create. As they say, 'two heads are better than one.' Carolle and I would love to introduce.... The Musette. Inspired on the 1960's cycling musette. We've created a slightly larger & roomier light weight bag. Now the size is 11x15" with a 40" strap including a strong easy to grab zipper. No buttons as the zipper provides a secure finish. You can hold a few more energy bars and most anything else. We chose a classic black cotton polyester twill fabric to compliment my artwork, to make it stand out. Carolle used a heat press material applied and stitched on the musette framed with the image from my Campy 42T inner chainring. Contrary to other musette designs, we conceived a ergonomic angled strap that hugs the back in a natural & comfortable way. We're offering these unique & cool musettes now through Galstudio. 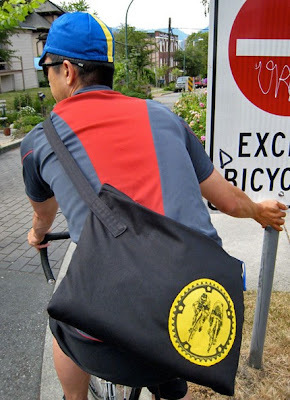 We believe that our classic musette bag compliments your own look ... on & off the bike!